When we talk about gravity, the first name that pops into our heart is Sir Isaac Newton. In school we all have been told the story of how Newton was inspired to formulate “The Universal Law of Gravitation” when an apple fell from a tree. 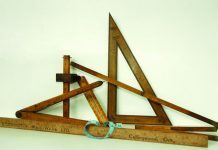 The world believes that Newton was the first to discover the gravitational concepts. You will be surprised to known that Indians knew the Laws of Gravity hundreds of years before Newton. India’s contribution to the subject of gravity began with Varahamihira (505–587 CE), a Hindu astronomer and mathematician who thought of the idea of gravity but did not give it a specific name or meaning. Varahamihira claimed that there should be a force which might be keeping bodies stuck to the earth, and also keeping heavenly bodies in their determined places. The Sanskrit term for gravity is Gurutvakarshan, which is an amalgam of Guru-tva-akarshan. Akarshan means to be attracted. The term Guru-tva-akarshan can be interpreted to mean, “to the attracted by the Master”. The 11th century saw the coming of another Hindu astrologer named Bhaskarachaya, also known as Bhaskara II. Bhaskaracharya was one of the most prominent astronomers and mathematicians of the 12th century. He is also considered as the greatest mathematician from the medieval era. He is known amongst the theorist for discovering principles on astronomy and calculus. In his treatise Siddhant Shiromani he writes on planetary positions, eclipses, cosmography, mathematical techniques and astronomical equipment. He continued the efforts of Brahmagupta and also contributed to ‘Surya Siddhanta‘, an astronomical text dated around 400 A.D. 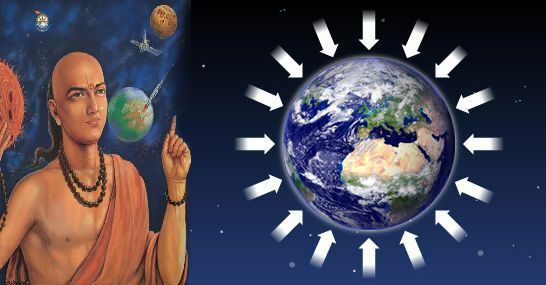 In Surya Siddhant, he explains that earth has gravitational force (gurutvakarshan shakti). There is a mutual attraction between the planets and this allows them to hold themselves firmly in space. Surya Siddhanta is partly based on Vedanga Jyotisha, which itself might reflect traditions going back to the Indian Iron Age (around 1000 BCE). Objects fall on the earth due to a force of attraction by the earth. Therefore, the earth, planets, constellations, moon and sun are held in orbit due to this attraction. The spherical earth stands at the centre of earth in space due to the dharanatmikam sakti which prevents earth from falling away and helps it to stand firm. if you draw a very big circle and look at one fourth of its circumference, you see it as a straight line. But in true sense it is a circle. Similarly earth is spherical in shape. These historical mentions are the proofs that laws of gravity was first discovered in India. India is considered as a traditional country but the world is unaware of our contributions to this modern world. Our theories were used as a base for many concepts such as weather forecast, astronomy, astrology, aviation etc. India has developed some of the best mathematicians the world has ever seen. Many of these geniuses were not given credit for their work. All these statements are just observations. Not a theory. If they had come up with a theory as to why objects fall towards earth, then we have something to claim. It is sickening to see folks desperately claiming that everything was discovered or invented by Indians in the past. Reeks of extremely poor self-esteem. Sir Isaac Newton’s was the first person to unravel the mathematical constants and variables governing gravity and other laws of physics. He pionneered our current understanding that laws of physics are actually underpinned by precise mathematics. There is no evidence to suggest that Indians made a significant contribution in this particular branch of physics. Nonetheless it is fair to say that it is very fortunate that Sir Newton was proficient in the field of mathematics developped by prolific ancient Indian mathematicians.